Template on Tariff Liberalization which will be used by Member States in preparing the AfCFTA Schedules of Tariff Concessions; and the designation of Sensitive Products and Exclusion List on the basis of the following criteria: food security, national security, fiscal revenue, livelihood and industrialization. Requested the African Union Commission, with the assistance of technical partners, to undertake an assessment of the requirements for the establishment of a future common market including steps to be taken as well as their implications and challenges, for consideration by the African Union Ministers of Trade. Requested the African Union Ministers responsible for trade to: submit the Schedules of Tariff Concessions, and Schedules of Specific Commitments on Trade in Services in line with agreed modalities to the July 2019 and January 2020 Sessions of the Assembly, respectively, for adoption; and conclude the negotiations on Investment, Competition Policy and Intellectual Property Rights, and submit the draft legal texts to the January 2021 Session of the Assembly for adoption through the Specialised Technical Committee on Justice and Legal Affairs. Recalled the decision which stressed the need to ensure that Africa speaks with one voice in the various platforms of partnership with the EU, and requested the Commission to ensure cohesion between the Post-Cotonou Agreement and the Post-2020 Continent-to-Continent Partnership, so that continental priorities, as articulated in Agenda 2063 and other related instruments, are consistently reflected in both tracks. Assembly decided that the Chair of the African Union for 2020 will be the Republic of South Africa. Requested the Chairperson of the Commission to expedite efforts aimed at convening in Addis Ababa, in 2019, an international conference on reconciliation in Libya under the auspices of the AU and UN. Reaffirmed its commitment to peace and stability in The Comoros. Commended the Federal Government of Somalia for the continued progress made in implementing the Somali Transition Plan (STP). Commended the African Union Mission in Somalia (AMISOM) for its critical role in degrading the capacities of Al-Shabaab and other terrorist groups in Somalia, as well as in the implementation of the STP. Paid tribute to the AMISOM Troop and Police Contributing Countries (T/PCCs), for the immense sacrifices made in the promotion of peace, security, stability and reconciliation in Somalia. Commended the South Sudanese stakeholders for the leadership demonstrated since the signing of the R-ARCSS and called on the opposition groups that have not yet done so to join the Agreement without any preconditions. Commended the Presidents of Djibouti and Eritrea for their efforts and commitments to normalize the relations between the two countries, in the framework of relevant PSC Communiqués and UN Resolution 2446 (2018). Welcomed the peaceful organisation of the elections in the Democratic Republic of Congo (DRC), and commended the people and the leadership of the DRC for a landmark peaceful transition. Encouraged all Congolese stakeholders to uphold their country's supreme interests above all other considerations and work together. Welcomed the signing on 6 February 2019 of the Political Agreement for Peace and Reconciliation in the Central African Republic between the Government and the armed groups of the Central African Republic, under the auspices of the African Initiative for Peace and Reconciliation in the CAR. Urged all CAR stakeholders to place the interests of their country above all other consideration and uphold their commitment and work together, in good faith, in the implementation of the agreement. Congratulated the Government of Burundi on initiating the preparatory process for the elections, especially the establishment, on 31 August 2018 of an Independent National Electoral Commission (INEC), according to the Burundian Electoral Code, as well as a Truth and Reconciliation Commission (TRC), in line with the Arusha Peace and Reconciliation Agreement, signed on 28 August 2000. In this regard, the Assembly, welcomed the statement made by President Pierre Nkurunziza not to stand as candidate for the presidential election in 2020, and urged the Government and the political parties to work together for the smooth conduct of the next elections. Took note of continued efforts by the countries of the Lake Chad Basin to neutralize the Boko Haram terrorist group, through the Multinational Joint Task Force (MNJTF) and called on the Commission to continue and intensify AU's support to the countries of the region in their fight against Boko Haram. Reaffirmed its determination to reinforce efforts towards better and more effective conflict prevention action in Africa. In this respect, the Assembly ENCOURAGES Member States to take full advantage of the structural conflict prevention tools developed by the Commission, including the Country Structural Vulnerability and Resilience Assessment (CSVRA) and the Country Structural Vulnerability Mitigation Strategy (CSVMS), and to enhance the capacities of youth to meaningfully participate in peace and security issues at the national, regional and continental levels. Expressed deep concern at the increasing terrorist attacks in parts of the continent and reiterated its condemnation of all acts of terrorism committed on the continent by whomever, wherever and for whatever purposes and also reiterated the AU's determination to rid Africa of the scourge of terrorism and violent extremism, which cannot be justified under any circumstances. Also requested the Commission to take, jointly with the United Nations and the Libyan Government, all the necessary measures for the organization of presidential and legislative elections in October 2019. Welcomed the growing acceptance of the legitimacy of the Common African Position on the reform of the United Nations Security Council; in particular, the full endorsement for the Common African Position as espoused in the Ezulwini Consensus and the Sirte Declaration by a number of Interest Groups and Member States from across all regions during the Intergovernmental Negotiations at the United Nations in 2018. Requested Member States with the support of the AUC, RBM Partnership to End Malaria, ALMA and partners to work towards an enabling environment and ensure the availability of affordable, effective, safe, next-generation malaria commodities through regulatory harmonization and support for local production including innovative initiatives to increase availability and scalability. Endorsed the Executive Council's proposal on the establishment of the Continental Operational Centre in Sudan for combating irregular migration as a specialized technical office of the Union for combating irregular migration with particular focus on human trafficking and migrant smuggling on the continent. Further called upon Somalia's external creditors to fully cancel Somalia's debt obligations as a means of relieving the country of a future debt servicing burden that may hinder its transition from conflict to peace and sustainable development. Strengthen the Secretariat of the Financing of the Union with a view of providing adequate support to the F15 and Member States. vi. Amendment to Article 35 of the Charter for African Cultural Renaissance. Thirty-Third (33rd) Ordinary Session of the Assembly: 30 and 31 January 2020. - Assembly appointed Ela Nchama Tomassa Bisia of Equatorial Guinea for a term of five years. The Assembly also adopted a number of declarations, resolutions and one motion. 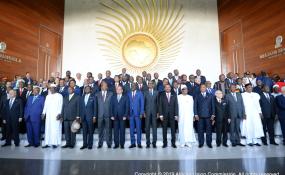 Details of these as well as the full decisions will be available soon on the African Union website.